We’ve all been there. It’s early in the morning, or perhaps late at night. You are starting (or ending) the day, and do what most of us do: tap on the phone’s screen to check your emails, only to find a handful of newsletters, company updates, pamphlets, reports, sure deals and other forms of email marketing. Your mind sighs – the body may join – and you proceed to delete most of the new messages, many of which have been appearing in your inbox for every single day since…how long? Months? Already? You tell yourself once again not to hit the ‘Report spam and cancel my subscription’ button because maybe, maybe you’ll need that promo/insight/freemium access in the near future, and want to be sure you don’t miss it for anything in the world. But alas, your denial to hit the ‘Report spam’ button is starting to feel like a teeny tiny, yet very noticeable rock in your shoe, a splinter in your mind, a new kind of itch. A few of days – or weeks – later, you find yourself able to bypass your (likely false) hopes of finding some use to that piece of information that is ruining your perception of email communications for a few seconds every day. The moment of letting go is here, and you do so while cackling out a “See you in hell, (name of the company)”. High with your newly acquired freedom, you start surfing the web again. Soon after, you find something that strikes you as incredibly fascinating and subscribe for free, daily updates. You’ll be using this information soon, so what could possibly go wrong this time? The example above happens by the thousands each day. People subscribing to updates (or worst, getting them just ’cause), getting tired of the messages and then experiencing resentment against the company sending them. The solution? Stop it with the daily updates! Companies managing your money and financial interests. Companies linked to your personal and professional networks. Companies providing you data linked to your core interests. 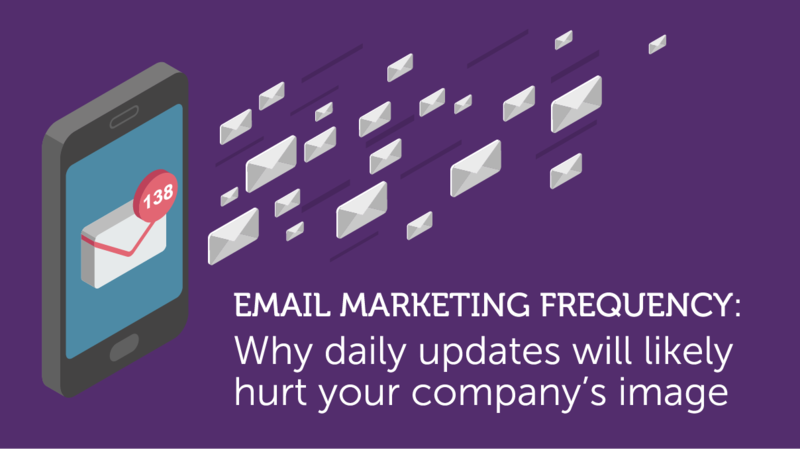 Simple curiosity and affinity are certainly not strong enough to sustain the ‘an email a day’ strategy. This means that yeah, we might sign up for updates, but daily updates? Give us a break. So, what can companies do? Let the interested party choose the messaging frequencies. Implementing this is not that hard. Analyze the data generated by email campaigns. Who opens them, how frequently, where do the clicks go? First and foremost: are people opening the emails? Ask your target if everything’s fine. There are companies that do this on a regular basis – and it shows both dedication and concern, lifting up the relationship. With these 3 steps, any company sending updates like it’s the end of the world should definitely do better. Any questions? Drop us a line and we’ll make sure to answer in no time!